NPS score survey results are extremely useful, but require too much time and effort to keep up to date in Salesforce. Automate that process and never worry about it again. On a scale from 0 to 10, how likely are you to recommend our company to a friend of colleague? This is the basics for gathering data used to calculate the NPS, or net promoter score, of your business. As an sales account manager, or a customer success professional, you know the importance of maintaining a positive relationship with your customers. While it is not a silver bullet metric, the Net Promoter Score, and the data used to calculate it, can be powerful in knowing how to drive your accounts forward. NPS is is a measure of your Promoters minus your Detractors. So taking the percentage of people who chose 9 or 10, and subtracting the percentage of people who chose a 6 or lower. The folks in between are your passives. How do you get a historic detractor to become passive, and then a promoter? How do you leverage an entire account full of promoters to boost sales and marketing influence? The first thing you do, is know who those people are. Sending out a survey, such as a Google Form or Typeform, is an easy way to gather the requisite data. Most customers will answer such a simple question. Storing and utilizing that data consistently can be time intensive. Instead of manually updating the survey scores for your contacts and accounts every day, use Parabola to automatically check for new results and update all of the appropriate records. Most serious sales teams use some sort of CRM to track their contacts and accounts, and many use Salesforce. While it is a robust tool, the amount of time and effort that it can take to maintain is daunting. Storing the survey results used to calculate NPS in Salesforce with your contacts and accounts is a smart move, but manually updating them there is not. With Parabola, you can build a simple flow that pulls in survey data (perhaps from Google Sheets if you are using Google Forms), looks up the Salesforce ID for that email, updates the survey results field, and uploads the changes to Salesforce. You could even average their old survey responses and track the historic average, giving you a sense of velocity. Easily know before your next check in if this customer on their way to becoming a promotor, or spiraling down into detractor territory. The same can be done on the account level. Averaging all of the scores for everyone using your product an a certain company, and averaging their historic scores, can be a powerful reporting tool for managers. Once you have a flow set up to do these tasks, simply set a schedule for it to run on, and never think about it again. 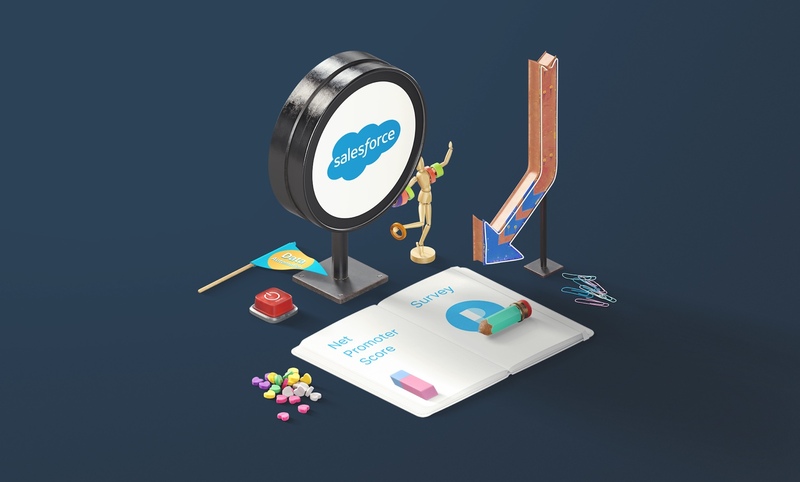 Salesforce is the ubiquitous CRM, and for good reason. It is highly customizable and has everything you need... except easy automation. Seemingly, the only solution is to hire out a firm that specializes in these dark arts, and pay them half of your revenue to create a black box that you can never tweak or improve. Instead of wasting time and money on the consultants, let the users or administrators of the CRM be in control of their automation. Any rep or exec can use Parabola to quickly add simple or complex automation to Salesforce, like the NPS survey results flow. Empowering anyone to create automation in Salesforce, without code or technical know-how required, will return a huge boost in productivity and happiness.